Got mine in blue and I am very satisfied, besides the screen tearing, does everybody else have this issue in scrolling the menu? And my volumeknob is acting a bit strange, when I use it to lower or higher volume it sometimes can go from ex. 45 to 43 on just one "click" on the wheel while highering the volume or reverse. Do I have a faulty device? The screen tearing is normal. The update 2.0 does reduce it if you have not done that yet. My volume steps Ok. It does do a funny bit where the same digit shows after a step. Anybody able to compare SQ (Stage, Resolution, Tonality) with other devices? I know I might be out of my league since I don't really post but I do have a comparison. Im using my trusted pair of Etymotic ER4 PT with the resistor cable. The M0 blows my Ibasso DX90 out of the water. There is no glare or shouty behavior like the DX90 when turned up. At full volume on the M0 it sounds great with ER4s. I know this will ruffle a few feathers and maybe its the L2 cable but I think it sounds better on its own than when its hooked up to the Mojo. Very clean and detailed. Im in disbelief that it sounds this good for its size. Are you able to compare SQ and Soundstage M0 to the Pono single ended? I had a slightly different result. I felt that it lost a little body and some instrument separation compared to using it with the Mojo. However it completely makes up for it with tighter bass and more clarity. Also I felt whatever the Mojo brings as far as more revealing sounds is completely irrelevant as Im drawn more to the clarity of the M0 signature. Its that Saber sound but without the glare. I also have an Aune B1 class A amplifier which fixed a lot of the issues I had with my DX90 and when using it with the line out on the M0 it actually degraded the sound. I don't know if anyone feels the same way, Im in disbelief. Im going to trust my ears for now and save some money. The weird thing is I want there to be something to be improved upon so I can add a DAC/amp for the sake of doing so but there is no justification. 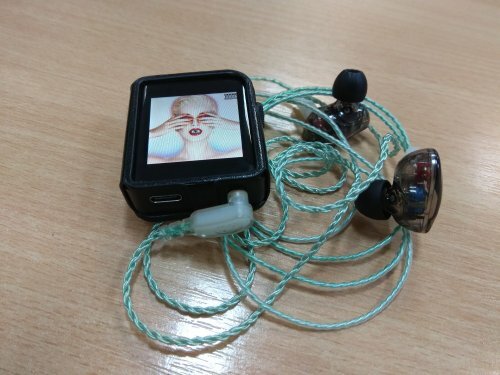 I have an old fiio X3 first gen that I will compare it to. If it is clearly better then I will be trusting my ears. Its so sad that the Mojo combo is not doing it for me anymore at least with my IEMs. ExpatinJapan and mehdikh423 like this. Just purchased. For $100 and the portability of the unit im impressed. I think sq is great. While im waiting m0, I've got a question. how the quility of ed16? The KZ ED16 is great for the price and has a great balanced sound. It comes with old style rubber cable which don't like that much to be honest. They are also easy to power as I am only on volume level 30 out of 100 on the Shanling and that is on low gain. Which is better ed16 or zs10 ? So how do these look in their cases?? Any good pics? I am still waiting for my black case to show up, it's been 9 days, and now it's in Germany, hoping it makes it here to Buffalo, New York by Christmas. About ready to buy another in a different color now that they are available with Prime shipping, and want to see how the colors look on the unit. I prefer the ED16 at the moment as it sounds more balanced and it is more comfortable but your mileage may vary. The ZS10 is a little more relaxed sounding with great low end. Below is the KZ discussion link.